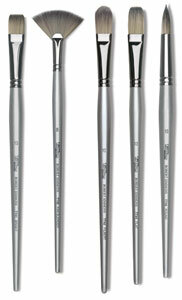 Titanium Pack Q — This set contains four long handle brushes: Bright #1, Filbert #2, Flat #4, and Round #0. 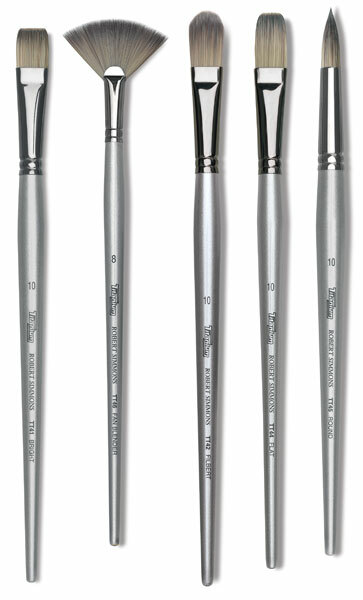 Titanium Pack R — This set contains four long handle brushes: Bright #4, Filbert #6, Flat #2, and Round #1. Titanium Pack P — This set contains four short handle brushes: Flat Shader #10, Filbert #6, Round #1, and Round #5. Titanium Pack O — This set contains three short handle brushes: Flat Shader #8, Filbert #4, and Round #3.